Thanks to Bill Booth for volunteering to lead this week’s 12 Ride (the last 12 Ride before the rides get renamed!!). “I am planning to lead the 12’s on a section of the Gran Fondo route, to grow familiarity for those who have committed to it. Therefore: B&Q, Saltash, Hatt, lanes to Callington, Liskeard, Duloe, down the Looe valley to Looe and then Hessenford and through to Torpoint and back to base. Cafe stop planned for Farmshop Cafe @ Widegates, although we may call into Louis @ Callington if demand is there. Bill, Assume you will be at the bridge 9:45 ish ?? Nice route Bill. I will catch up with you on the ferry to go over to B&Q. Look forward to it Bill. Plan to meet at the bridge. Bill thanks for planning and leading a great route despite having 4 puncture stops. Clocked 56 miles so suitably exhausted to sit and watch the Rugby. Thx. 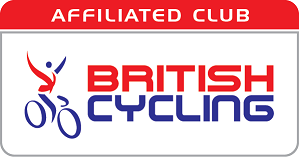 Membership of British Cycling provides many benefits including £10m liability insurance (not Bronze). Click the logo for further details.